Unlisted REITs do not trade on a stock exchange. 1. What Financial Instruments to Buy When Stocks Fall? To the extent that Real Estate Investment Trusts (REITs) trade on major exchanges in the public markets, they are correlated to the stock market. They are subject to the same conditions that can cause stock prices to gain and lose value. Nonetheless, REITs do possess some features that separate them from more conventional stocks. As a result, REITs do provide some level of diversification to investors but not as much as financial securities in other asset classes such as bonds or commodities offer. 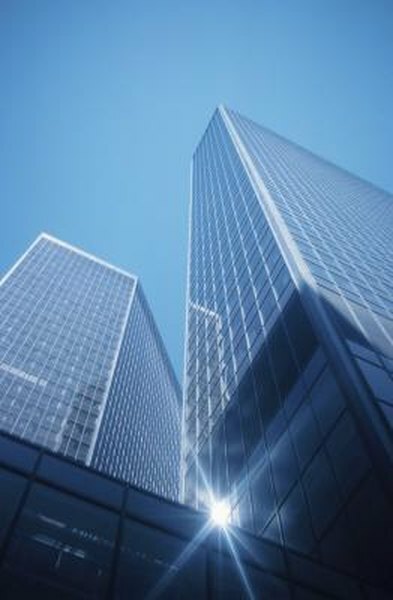 REITs are funds that invest in commercial properties, including office buildings, shopping malls and apartment complexes. REITs are structured so that their issuers collect rent from their tenants. In exchange for tax benefits, issuers must return 90 percent or more of profits back to investors each year via dividend payments. Publicly traded REITs list shares on a stock exchange, trade under a particular trading symbol and have a market value just like traditional non-REIT stocks. Traditional stock prices are highly driven by corporate profits, and whether or not earnings satisfy estimates. REIT values are largely influenced by the amount of income collected from property rents. As real estate property values increase, rents similarly rise and REIT issuers collect higher income, which leads to higher dividend payments. In turn, higher dividends attract a greater number of investors and the value of the REIT increases. The fact that traditional stock and REIT prices are driven by separate factors diminishes the correlation between the two groups. In the 10 months leading up to July 2012, the MSCI U.S. REIT index increased 30 percent while the broader stock market gained 22 percent, according to a 2012 "Smart Money" article. When it comes to volatility, which occurs when the stock market displays unexpected and sometimes unwarranted price movements, the stock market and REITs are closely correlated. REITs are considered equity investments and are not immune from the risk of declining prices. Indeed, financial advisor Darius McDermott of Chelsea Financial Services is cited in a 2012 "Financial Times" article stating that at times, REITs can be no less volatile than stocks. Worse, REITs can also be more volatile than traditional property investments. The correlation of REITs to the stock market can change. REITs were once considered highly uncorrelated to stocks. However, in 2008, once the economy entered recession, the correlation gap narrowed. In that year, the Vanguard REIT Index Exchange Fund, which is representative of trading in the REIT sector, lost 38 percent, which was just as much as the largest companies that trade in the stock market, according to a 2012 "Wall Street Journal" article. In fact, in the 10-year period leading up to 2012, the correlation between REITs and the stock market doubled, the article indicated. CNN Money: Are REITs A Safe Investment for Retirement? How Does the Volatility in Equity Markets Affect a Portfolio?